The River Barge | Just Shooting Memories! The Tennessee River starts just outside of Knoxville Tennessee and flows through four states before joining with the Ohio River. The Watershed flowing into the Tennessee River drains from three more states. The river in Chattanooga is deep and wide enough to support some large barges. 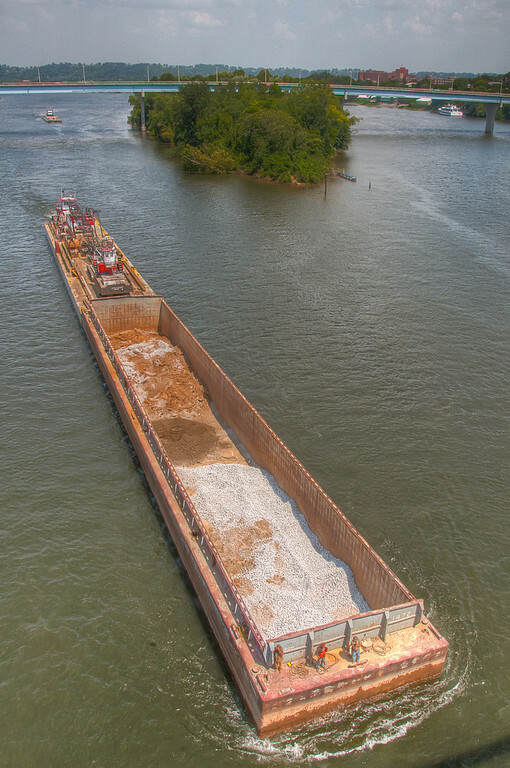 I was crossing the pedestrian bridge in Chattanooga when this barge was being pushed downstream. It was interesting watching the three people on the front of the barge. At first, I thought they just wanted the best seat in the house. Then, the closer the tug pushed the barge to the bridge, I began to realize that the three of them were performing the important function of guiding the ship. I am truly glad they were there. It is a long fall to the water from where I was standing.